I think we judge talent wrong. Things like determination, courage, discipline, temperament, these are also talent. With this Rahul Dravid quote, Stephæn opened his review of Konstaninos Papachristou's Aquarius phono stage. He found that Konstaninos' got major talent. 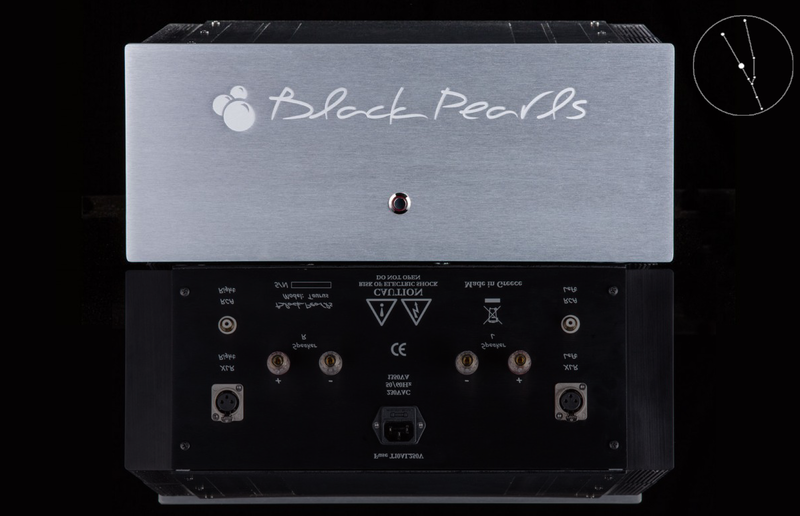 Leading up to this conclusion, Stephæn found himself in astonishing agreement with every one of my sonic bullet points which had finished off my far earlier writeup of Black Pearl Audio's maiden product, the Birth 100 integrated. That model had been followed with the matching Virgo top-loading CD player. At the Munich HighEnd 2014 show, the separates theme continued with the latest Aries/Taurus pre/power duo. To dress up its expanse of otherwise empty fascia, the Taurus gets a deeply engraved big logo across. Were those new components to fall in line and cross off our now combined sonic bullet points one by one, I wouldn't have much work to do. I'd be free to vicariously quote from myself and my longest-running contributor whilst admiring our Greek's ability to imbue various stations along the signal train track with exactly the same qualities. That would demonstrate rare consistency of sonic vision. It's called a house sound: a recognizable flavour that makes conrad johnson sound different from Audio Research, Pass Labs different from Spectral. Konstantinos: "The Taurus power amplifier follows the same design concepts as the Birth 100 integrated. It too is a dual-mono design with separate power supplies for its pre/power circuits. A 1KVA toroid transformer is dedicated to the output section—no separate transformers as in the Birth 100 due to space restrictions—and another 300VA toroid for the input stage. A separate 50VA transformer is dedicated to the control logic's power supply. The input circuit is class-A single ended which feeds the complementary output stage which is deeply biased for class-A operation. 3 pairs of audio Mosfets per channel deliver 230Vrms per side into 8Ω, 340wpc into 4Ω. Total filter capacitance per channel is 96'000μF, slew rate is 54.8V/μs. The whole design uses zero local or global negative feedback. Thermal shutdown ensures that no damage is done in case the amp runs very hot and current limit shuts down the amp for protecting the output devices. "The Aries preamplifier has 2 true fully balanced XLR inputs, 6 RCA inputs, 1 input for the optional phono stage, 2 RCA outputs, 1 XLR output, 1 fixed output and a headphones output. All outputs can be used simultaneously. Here again we have a dual-mono circuit with separate power supplies and a class-A single-ended gain stage with software selectable 6dB/9dB gain assignable to each input. The Aries uses a relay-controlled 64-step attenuator which results in a better sound than common pots and has the advantage of allowing remote control without a motor. The optional phono stage is exactly the same circuit as in the Aquarius phono stage (the customer can select either the fixed or adjustable module). "The sonic goal for the pair was the same as for the Birth 100: uncolored sound with complete lack of harshness to relax the listener and make her reach for another album or put him in party mode should the mood strike. A finely balanced system should be able to do both equally well. Wanting to be compatible with a wider variety of speakers, the dedicated power amp had to be powerful enough to drive almost every speaker regardless of the challenge of its load, hence the 230Wrms rating." Black Pearls Audio exhibit at Munich HighEnd 2014. Matching Virgo top-loading CD player on top.